Fibria is a Brazilian company that believes in planted forests as a source for sustainable development. A world leader in the production of eucalyptus pulp, the corporation operates in 261 Brazilian municipalities and exports to 35 countries. Fibria's 2017 Report, which is being released now, contains the practices, results and challenges faced by the organization throughout the year. The publication highlights the strategic vision of the company in the face of the double challenge of climate change and of the construction of a new paradigm of sustainable development based on a low-carbon economy. The theme A Forest of Opportunities makes reference to the moment experienced by Fibria in 2017: the financial and market gains brought by the startup of the new pulp mill in Três Lagoas (located in Mato Grosso do Sul state, in Brazil) gave the company better conditions to look ahead and analyze future opportunities to diversify the product portfolio using innovative ideas and advanced technologies applied to its forest base. "If I could summarize 2017 in a few words, I would say that it is in periods of crisis and difficulty that we sustain what is most relevant. We took care of the business and of people, and never failed to invest in our environmental and social performance," says Marcelo Castelli, Fibria's CEO. Following its strategy, Fibria also faces the challenge of transforming the technological lines of research into products that have value for its customers. "Innovation in biotechnology reveals enormous opportunities to formulate materials that meet new societal demands, with a much friendlier ecological footprint than mineral or fossil fuel products," says José Luciano Penido, Fibria's Chairman of the Board of Directors. 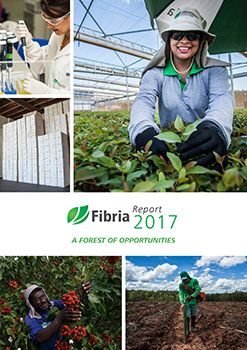 The digital edition — full version and main support of Fibria's 2017 Report - provides access to the content with more in-depth information, attached documents (such as infographics and cases), and to an Indicators Center that graphically presents the company's key performance indicators, intended for a more technical and specialized audience. Videos containing the testimonials of Fibria's Chairman of the Board and the CEO support the narrative on the aspects that are important to the company. In addition to the digital format, there is an abridged printed version and two infographics, one of which presents the company's value creation model and the other contains its production process. The 2017 Report follows the guidelines of the Global Reporting Initiative (GRI) and of the International Integrated Reporting Council (IIRC), and uses the Sustainable Development Goals (SDG) as a reference. For the first time, the process to develop this publication took into account the guidelines of the report of the Task Force on Climate-Related Financial Disclosures (TCFD), a business initiative created by the Financial Stability Board (FSB). Fibria's second pulp mill in Três Lagoas (located in Mato Grosso do Sul state, in Brazil) has started-up before the expected date and below the estimated cost, a goal that reflects the company's competitive position. The new mill has the most modern technology in the world among its peers and brings advances to the industry of the future, which will be digitization and artificial intelligence. “We have learned a lot from this expansion. One such learning is that without open dialogue and alliance we would never have completed the construction with good results. That's why we worked together with public authorities, suppliers and the community to minimize the impact of the arrival of thousands of professionals in the municipality during the construction," says Marcelo Castelli, Fibria's CEO. Fibria has created its institutional position statement with the support of the professionals who are part of the Diversity and Inclusion Commission. We believe that diversity of people, experiences and cultures brings a profusion of ideas and solutions for the business. In 2017, the consulting company FSG, created by Michael Porter and Mark Kramer, demonstrated the application of the shared value concept - a management strategy - in several initiatives led by Fibria, including the Rural Land Development Program (PDRT). 2017 was a good year for Fibria and may be summarized in several points: significant increase in production, record sales, lower costs, and a significant reduction in leverage. Supported by increased production capacity, as a result of the startup of the second pulp mill in Três Lagoas (in Mato Grosso do Sul state, Brazil), and by a heated global pulp market, these results reinforced our financial soundness, as evidenced by the improved credit conditions and confirmation of the investment grade assigned to Fibria by two international rating agencies. On March 15, 2018, Fibria's controlling shareholders –​ Votorantim S.A. and BNDESPar (BNDES Participações S.A.) – entered into an agreement with Suzano Holding S.A. and with the other controlling shareholders of Suzano Papel e Celulose S.A. to merge Fibria and Suzano. This event represents the strengthening of the pulp industry and of the forest-based sector in Brazil.Until the operation is concluded – which depends on the approval from the regulatory agencies – Fibria and Suzano will not undergo any change in the conduct of their activities and will continue to operate independently.